High-quality website development takes your site’s design a step further by making sure that your site can be easily indexed by search engines and simple to use for your customers. All of this is essential for converting website visitors into customers and, ultimately, boosting your sales and delivering ROI. If you own an ecommerce website, find out more about our ecommerce web design and development services. Does your current content management system (CMS) make it hard to maintain your website? Looking to update your website and CMS quickly and efficiently? Kentico is a CMS that anyone can use, and allows you to easily update and edit your website content. At Xanthos we build our non-ecommerce websites using Kentico CMS as it provides SEO-friendly page functionality, and boasts a range of functionalities through its modular design. It’s a truly exceptional CMS package which allows you to easily add pages, manage and edit page files, edit layouts, upload photos, videos, documents and much more. 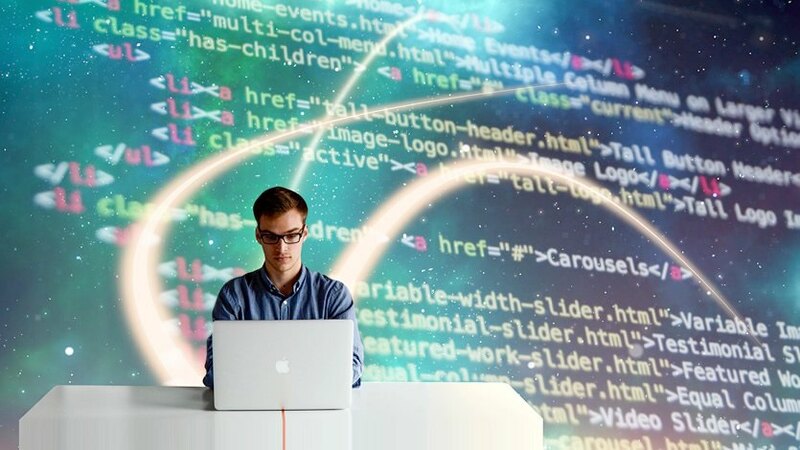 We create unique designs to work with the CMS, customising its functionality to provide exactly what you need in order to deliver the best possible user experience in-line with your online business goals. Kentico is used in over 18,000 websites across 90 countries worldwide, with 74 of the Global Fortune 500 using Kentico CMS. Kentico is a popular CMS software package because of its ability to completely address the needs of its users. 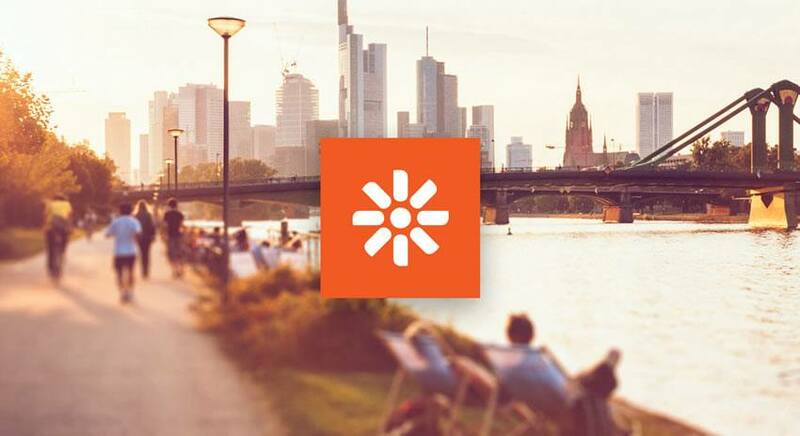 Xanthos are partners of Kentico content management software. As search engines continue to roll out updates that lend great importance to fresh web content, the need to continually update your website is more important than ever before. A CMS is the easiest way to make this happen. Combining expert web development with Kentico CMS, Xanthos can seriously increase your website’s competitiveness and SEO impact, to get your brand found online. 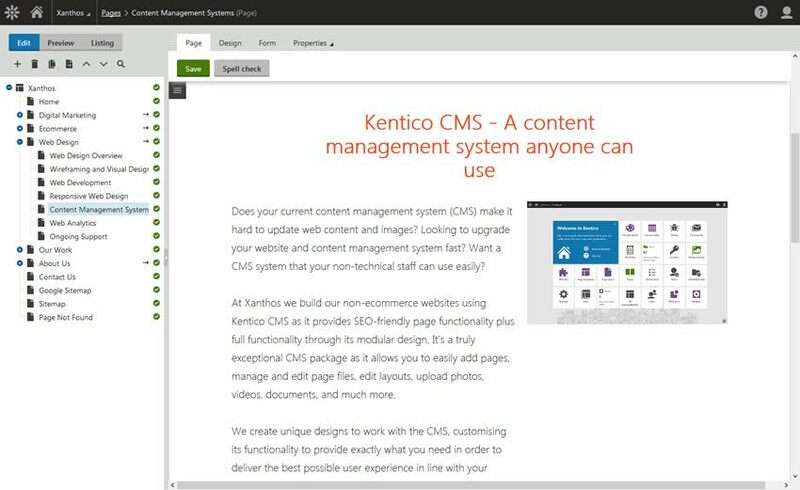 Kentico CMS provides a powerful content editing suite that allows users to edit content, preview content, organise site structure and manage an array of useful modules. 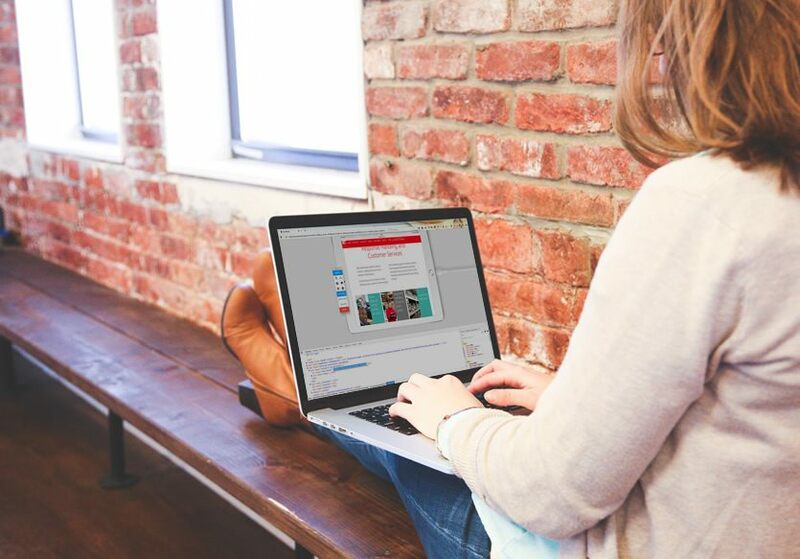 The fully integrated WYSIWYG editor comes with basic or advanced formatting, uploading of images, plus the ability to link to other pages or external files and sites. The content is organised into a tree hierarchy which represents the sitemap and navigation structure. Content created by web designers can be re-used by content editors for several pages with the same layout. Page templates can either contain editable regions where content editors enter the text, or they can display structured documents. You can define custom types of documents stored in the Kentico CMS repository. Files in Kentico CMS can be managed in the same way as any other document. You can even leverage advanced content management features such as workflow and versioning or multilingual support for files. It allows you to display the information in several ways (catalogue preview, short description, full technical details, etc.) and to keep data in a standard database structure. Content authors can edit uploaded images through the web-based interface. The editor supports basic operations, such as re-size, trim, rotate, convert or greyscale. Kentico CMS allows you to display images resized to given width, height or maximum size, without having to use an image editor. The resized image can be stored on the disk so that it needn't be resized again. If you need to publish large files such as music, video or application installers, you can use media libraries. Media libraries allow you to work with content uploaded to your server and publish it on your website. The media gallery also allows you to play video and music online. You can extend it with your own viewer controls for custom formats. Workflow allows you to manage the process of content creation and modifications. Kentico CMS enables web masters to prepare customisable workflows or approval processes for different document types and site sections. Appropriate users are automatically notified by email when a new document is waiting for their approval. The document can be edited, approved or rejected by any user who is authorised for the given workflow step. Kentico CMS optionally stores all previous versions of the document so that the editors can view them, compare versions side-by-side and roll back to a previous version. When workflow and versioning is used, you can also turn on content locking. It requires users to ‘check out’ the document for editing. Other users cannot edit the checked-out document at the same time, which avoids two people working on the same document concurrently. If you need to build international websites in multiple languages, Kentico CMS is the right choice. It allows you to organise multi-language content and switch between different languages of the same document in the editing interface and on the live site. 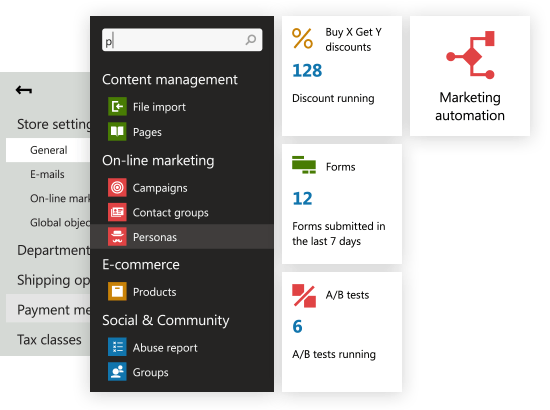 Widgets allow editors to add dynamic or interactive content such as online forms, latest news, subscriptions, customise page layouts or add side columns. 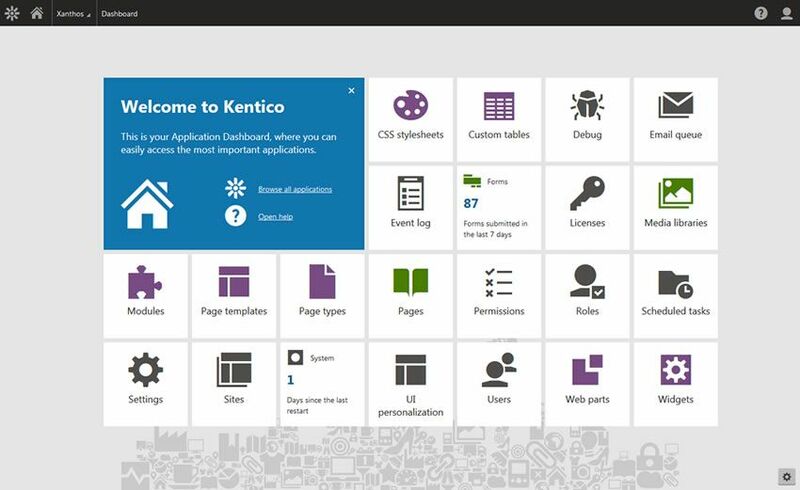 Kentico CMS supports both forms and Windows authentication. You can have the system import user accounts from a Windows domain or Active Directory automatically. Moreover, you can write your own authentication provider that will import user information from an external database. You can grant user permissions for particular modules and for particular documents or site sections. It means you're not limited to some predefined roles. You can also control the access rights of site visitors. You can create secured site sections that are only accessible by registered members. The members can be displayed with personalised navigation and content based on their permissions, so you can display, for example, different menu items and content to silver and gold partners in the partners section of your website. Kentico CMS contains a fully-customisable authentication system that allows you to authenticate users against any authentication service. Kentico CMS supports out-of-the-box integration with the following authentication services: Live ID, Open ID and Facebook Connect. Websites built with Kentico CMS for ASP.NET offer a rich set of features in combination with unmatched flexibility. Site design, page layout and navigation are completely customisable. Even if you find some standard feature limiting for your needs, you can easily enhance it with custom .NET code or replace it with a third-party component. All controls are XHTML compatible with drop down menus: CSS list menu, tree menu, dynamic sitemap and breadcrumb navigation. When your website is designed and built, we can manage the hosting of your website for you. As we are a Rackspace hosting partner, you will receive one of the best hosting services available, offering robust, secure, and reliable hosting. Rackspace is ISO27001 and PCI certified, and offers a strong service level agreement. In order to ensure you’ve always got a helping hand and that your website runs smoothly on a continual basis, Xanthos provides a website support service. Post-live website support covers most of the basic changes and tweaks you will need to make over time. This includes things like simple design changes or enhancements, simple coding tweaks, loading images, help with admin access and content loading. Do you have specific functionality in mind? If so, get in touch and we will help you build the right solution to meet your business needs. 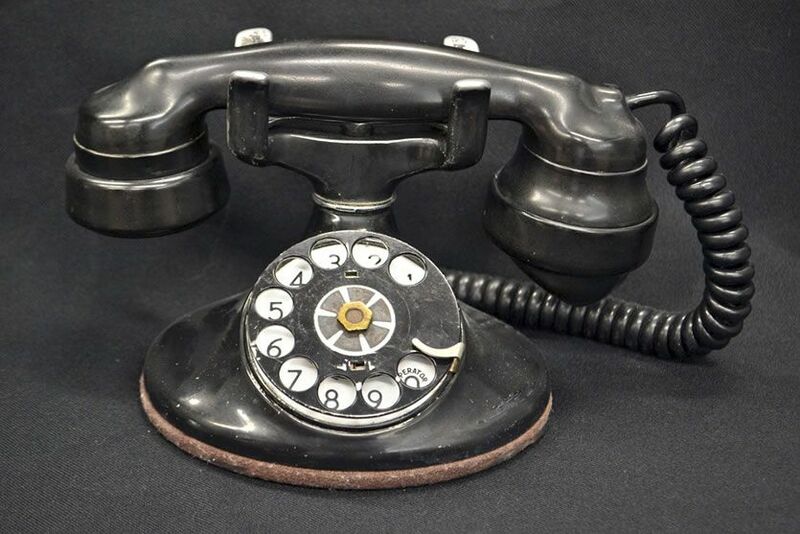 Let us know your requirements and we will be in touch shortly. Fill out the form to let us know your requirements and we will be in touch shortly to discuss how we can help grow your business.